Some rock minerals have special characteristics that allow them to glow fluorescent under UV light. Some minerals glow only under longwave UV light, like that produced by commercially available black lights. Others glow under shortwave UV light. Shortwave UV rays are damaging to the skin and can cause sunburn, so these bulbs are not commercially available. Even though a rock is known to fluoresce, that does not mean every specimen will glow when exposed to UV light. The ability to glow depends on the presence or certain organic minerals from the earth that make up the rock. Fluorite, known in chemistry as calcium fluoride, is a crystal rock mineral that comes in several colors and is known for its glass-like appearance. 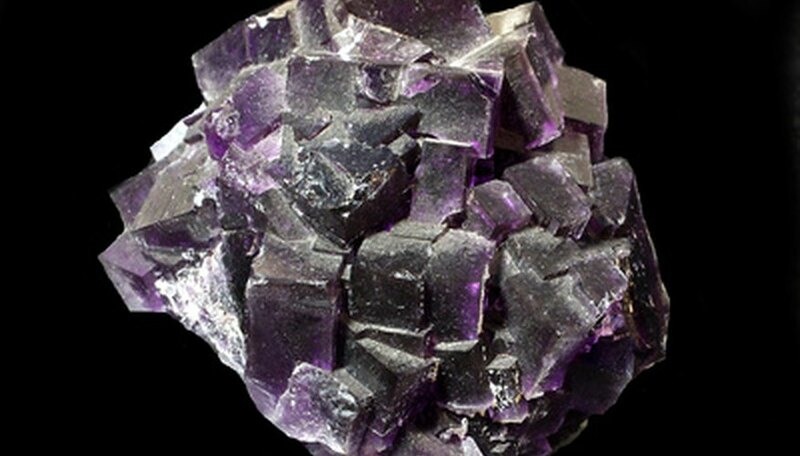 Fluorite is commonly purple or blue, but it can range in color from black to orange to clear. When fluorite is placed under UV light, it will glow. Under longwave UV light (such as black light), fluorite typically glows blue, but can also appear green, yellow, white, purple or red. Under shortwave UV light, the rock may appear a different color than it does under black light. The word "fluorescent" is derived from fluorite, because the mineral was one of the first glowing rock specimens studied. Calcite, known in chemistry as calcium carbonate, is one of the most common rock minerals in the world. It makes up about 4 percent of the weight of the earth's crust. Calcite comes in many varieties and colors, but specimens are commonly white or clear with shades of another color. Calcite can fluoresce different colors, depending on where the rock originated and what elements, such as manganese, it contains. Typical fluorescent colors include red, yellow, pink and blue. Scapolite is a gemstone and mineral specimen typically found in short and long prismatic crystals. 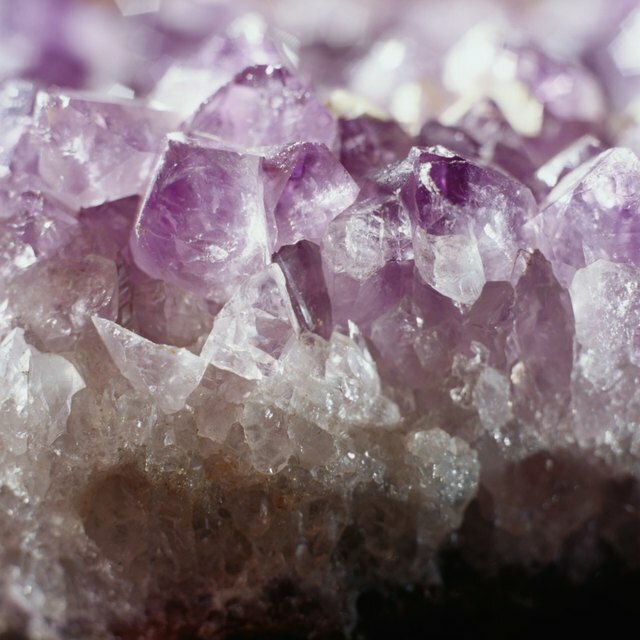 Scapolite colors are generally yellow to orange, or pink to violet. Scapolite can fluoresce under longwave UV light, such as black light. It commonly glows orange or yellow and, in rare instances, red. Autunite, known in chemistry as hydrated calcium uranyl phosphate, is a radioactive mineral. It contains uranium, which causes the radioactivity. Autunite is popular among rock and mineral collectors. Under natural light, it is a yellow-green color and appears to glow. Under longwave UV light, such as black light, the rock fluoresces a bright green or yellow. Because autunite is radioactive, human exposure should be limited, and it should be stored away from other minerals that are effected by radioactivity. Which Types of Granite Emit the Most Radon? Rico, Laura. "What Rocks Are Fluorescent Under a UV Light?" Sciencing, https://sciencing.com/rocks-fluorescent-under-uv-light-6506144.html. 25 April 2017.